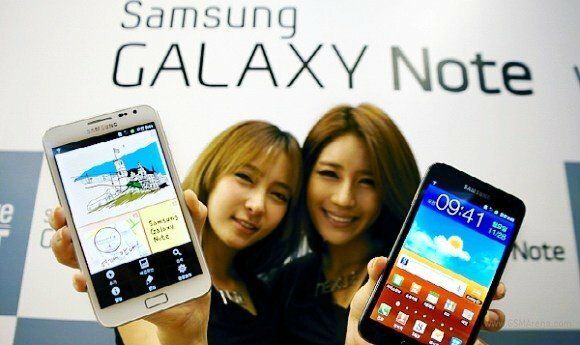 Galaxy Note Android 4.0 ICS source code is available now, why Samsung must release the source code? Today, Samsung finally released the Android 4.0 (ICS) source code for Galaxy Note. If you are enthusiastic developer, you can work out your own ROM now very easily. Very likely, within one month, several different flavors of Galaxy ICS ROMs will be floating around. Why does Samsung (and all other licensed Android hardware manufactures) have to release the source code to the public? This is simply the obligation of using Android, because Android is using Apache license 2.0 except the Linux Kernel (which uses GPL v2 license). Under Apache 2 license, user has the right to get the source code so that they can modify as they want (although this very likely will void the product warranty). So, the manufacturer MUST make the source code available to users, but it is NOT necessary to be under Apache license. For example, Samsung has its own license on using the the Android source code released by Samsung. The Linux Kernel is released under GPLv2 license, which requires all modified work must also be released under such a license. Sometimes, this is named as “copyleft” license. Under this license, user get more controls of the source as manufactures are NOT allowed to impose additional terms on using the source code. But due to its copyleft obligation, manufacturers usually want to avoid such license for competition reasons. Although there are some critics on the openness of Android project, Android is unarguably the best open source OS for mobile phones. It gives you the freedom you deserve. 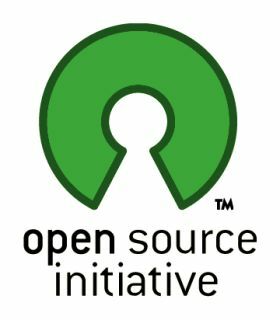 This is one of the biggest advantages of using open source software, for consumers. You are not locked in; you can check how good or how crappy the code is. For fruity fanbois, or M$ slaves, they never understand what freedom means, as a consumer. The long-waited Ice Cream Sandwich (aka Android 4.0) is quietly rolled out to unlocked Galaxy Notes. This is firstly reported by Devin Balentina. It seems only some users in Europe can update now, and none of users in Asia can get it up to now. The size of this update is reported at 318MB. The hyped Premium Suite is included. Of course, this update is for international version, not the US (AT&T) version. I will post my hands-on report once my Note get updated. Update 1: The update is only available for Galaxy Note users in Europe up to now (8:50am GMT, May 11). Update 2: Samsung Mobile Singapore confirmed the ICS update for Singapore Galaxy Note users is still under local testing. So, Singapore Note users have to wait at least a few weeks. Update 3: Samsung Mobile Hong Kong confirmed the ICS update will be available for Hong Konmg users in May. Update 4: Update for US (AT&T version) Galaxy Note users has not scheduled, although the leaked ROM seems close to release. But AT&T will decide when to roll it out. Update 5: ICS update for Galaxy Note has been rolled out in India and Korea today (May 23). Update 6: ICS update for Galaxy Note has been rolled out in Singapore today (May 25). 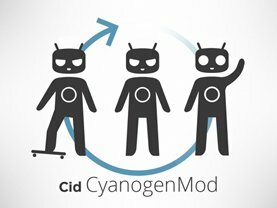 CyanogenMod is an aftermarket firmware distribution and CyanogenMod 9 is for Android 4.0 (ICS). Now, there is a mostly workable distribution for Galaxy Note with S Pen support. The good thing is the firmware works for both international version of Galaxy Note and the AT&T version. Yes, about 5 million Galaxy Note users are patiently waiting for the update to the delicious Ice Cream Sandwich (ICS, aka Android 4.0) since last November. Initially, we heard the ICS update will be available together with Galaxy SII in March. Later, Samsung officially announced the ICS update for Galaxy Note would be pushed to Q2, with Premium Suite specially for Galaxy Note. Yesterday, another ICS ROM for Galaxy Note was leaked. According to Rootzwiki, the build is for AT &T version, not the international version. It has most functions (e.g., face unlocking) expected in ICS and almost all works flawlessly. Anyway, it seems the waiting for ICS on Galaxy Note will be over soon! 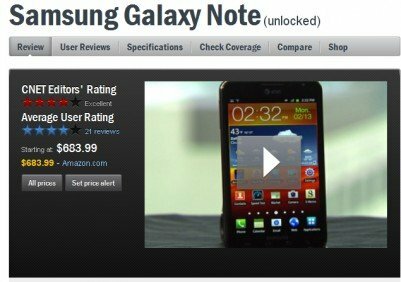 5 million Galaxy Note Users cannot be wrong! Samsung just announced they shipped 5,000,000 Galaxy Note. 5 months, 5 millions units shipped, it is impressive! Potentially (some are still in the vendors’s warehouse) 5 million users! For a smartphone, whose 5.3″ size was questions by many reviewerssince its initial release 5 months ago, it is a big success. 5 million buyers proved there is a genuine market for such Phablets. I like the size as written in the Size Always Matters post. Hope Samsung can maintain the momentum and push out Ice Cream Sandwich update to Galaxy Note earlier. In February, we reported that Galaxy Note probably would get the Ice Cream Sandwich (ICS, aka, Android 4.0) update in March (together with Galaxy SII). Obviously, Samsung missed the target. Galaxy SII users in Europe and some other regions started to receive ICS update about two weeks ago. Nothing for Galaxy Note users. Last week, Samsung officially pushed the date to Q2. So, your waiting time should vary from one week to one week plus 3 months. Usually, when a phone manufacturer tells in Q2, it usually means June; it seldom means April. 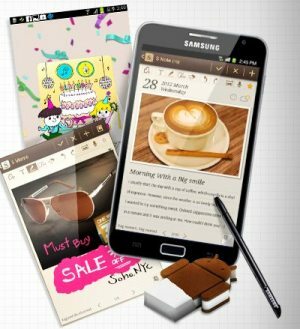 The good news is that Samsung will bundle the S-Pen “Premium Suite” Apps together with your delicious ICS. You may watch the preview video of this “Premium Suite” on Youtube. It is not so bad, anyway. Recently, I read so many reviews complaining on the size of Galaxy Note. The resentments include: it is too large; the reviewer cannot operate it with one hand; it looks stupid when you hold it near your ear. So, when I read the complaints on the size of Galaxy Note, it reminds me about this M$ guy. Think out of the box. The reviewers concerning the dimension of galaxy Note are just a bunch of Steve Ballmers. Why smartphone should be operated by one-hand? You get two hands! You get used to using one hand, because the phones you are using does not need two hands. When you strain your eyeballs on the 3.5” LCD screen, is it comfortable to get a 5.3″ Super AMOLED? When you use your fat and dirty finger on the tiny screen (is it for Gorilla? ), is it more elegant to use a S-Pen on a larger display? Why are you so cared about others’ eyes when you hold this phone near your ear? Are you are super star? Are they really care about you? No, for sure. I like this phone because of its size. Advice for man: size matters! Full HD, at least!. Advice for ladies: size really matters! Mirror is bigger, at least. 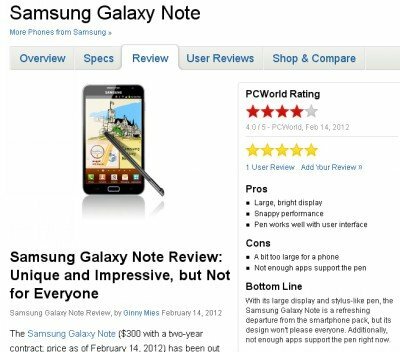 As Samsung Galaxy Note is heading to the US market, a lot of reviews for US (AT&T) version of this phone were published last week. Here we compiled a list of such reviews from CNET, PCWorld, engadget, phandroid, Android Community, as well as a negative review (seldom get) from Los Angeles Times. Galaxy Note got a quite good review on performance, phone quality, 4G LTE connectivity, 5.3″ display, and the camera. The editor’s major concerns are: 1). the S pen is too small and 2). the size of this device may be awkwardly large for some people to fit into pocket. The good: The Samsung Galaxy Note’s 5.3-inch HD screen is ideal for showcasing multimedia. 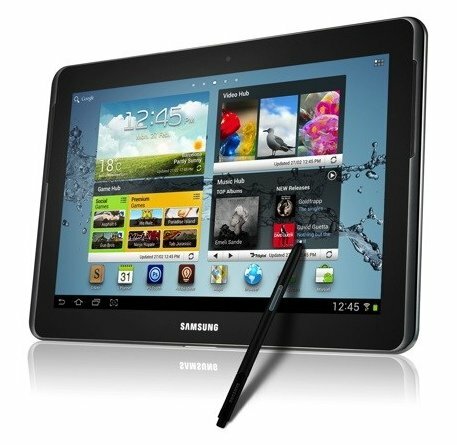 It has 4G LTE, a great 8-megapixel camera, and a souped-up S Pen stylus that brings new ways to interact with your phone. The bad: The Galaxy Note’s S Pen is small, has a delayed response, and requires a little training to use. The phone will be awkwardly large for some, and it doesn’t fit easily into pockets. The bottom line: With its huge screen and throwback stylus, the Samsung Galaxy Note is a polarizing smartphone that winks at tablet territory. Those who like their screens XL will find a top-notch device that lets multimedia shine. The S Pen adds some artistic potential, but for some, the phone will just simply be too big. The review is quite positive. The reviewer dived into some aspects that other reviewers overlooked, e.g., Samsung’s TouchWiz UI, S Memo. The reviewer’s major concern is the lack of apps for S Pen. Spot on. The conclusion is unique and impressive, but not for everyone. 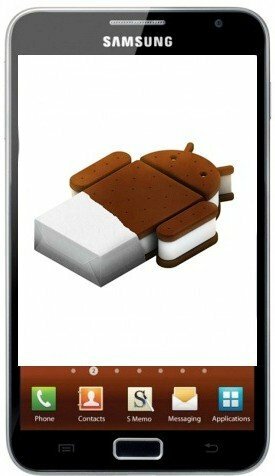 Tipster Eldar Murtazin (Editor-in-Chief of Mobile-Review.com) said Android 4.0 (aka Ice Cream Sandwich, ICS) will hit S II in March in a recent tweet. In November 2011, Samsung confirmed Ice Cream Sandwich would be coming to its Galaxy S II and Galaxy Note smartphones some time in 2012. In last December, the release date was further narrowed to the first quarter of 2012. According to the information we received, Samsung is still testing the firmware update on selected handsets in Korea. The roll-out date has been tentatively scheduled in the first week of March through Kies first in Asia, immediately followed by Europe market. Interested? wait another two or three weeks. Finally, US pundits will be able to put their hands on this tablet smartphone on Feb. 19. 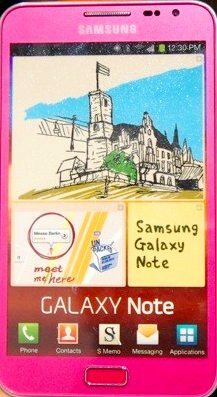 AT&T is now accepting pre-orders for Galaxy Note, with a price of $299.99 (for 2 year contract) through its online shop. Please note, the US version of Galaxy Note gets 4 capacitive buttons on the device. This is different from the models offered in Europe and Asia, which come with 1 physical home button and two capacitive buttons.